Author: Berlich, R., Bonten, C.
Aging and chemical resistance are probably the most underestimated parameters influencing the performance and lifetime of plastic parts. This powerful tool provides you with an overview of the different interacting aging mechanisms and their influence on plastic parts and their properties. 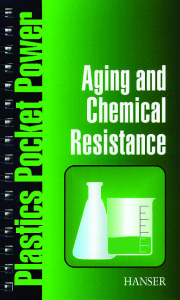 The unique table of chemical resistance delivers information on how the major plastic materials hold up to chemical influences: from acetic acid to zinc chlorides. Pocket-sized and condensed, yet clear and comprehensive! Plastics Power in the Palm of your Hand! Author: Castaño, N., de Greiff, M., Naranjo, A.
Belts, seals, hoses, engine mounts, not to mention tires--modern life without rubber products is incomprehensible. This convenient tool will guide you through the selection labyrinth for material blends, additives, compounding equipment, and vulcanisation system. 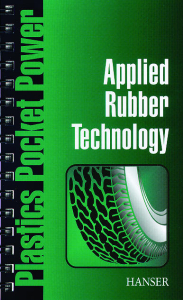 Detailed examples and proven recipes will clear ypur path to successful design and manufacturinbg of rubber products. Pocket-sized and condensed, yet clear and comprehensive! Plastics Power in the Palm of your Hand!